Students will describe objects in the environment using names of shapes. Students will name shapes regardless of their orientations or overall size. Students will be able to state the attributes of a circle, square, rectangle, triangle, and octagon. Variety of small shapes cut out. (Printable worksheet included to be copied on construction paper in a variety of colors) You may choose to have your students cut out the shapes. Attribute: A characteristic that something has. For example, John has brown hair. That is one of John’s attributes. Circle: Goes round and round (circle your arm around), no sides, no corners. Square: Gour sides all the same size, four corners. Triangle: Three sides, three corners. Rectangle: Four sides, two sides short and two sides long, four corners. Octagon: Eight sides, eight corners and looks like a stop sign. 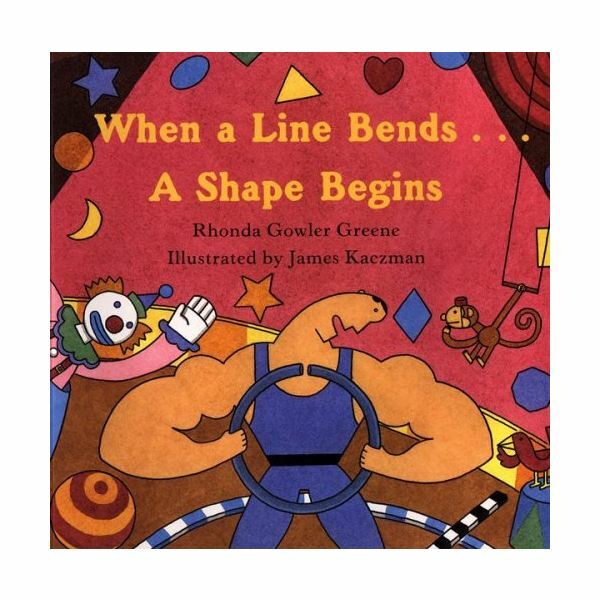 Begin by reading the book When a Line Bends a Shape Begins. This is a colorful book written in rhyming verses. It includes ten shapes: circle, square, triangle, diamond, rectangle, octagon, star, heart and crescent. Then concentrate on the shapes in your objectives by teaching the children the attributes of each shape. Use hand motions when appropriate. Repetition is the key. Each time you identify a shape explain the attributes of the shape. Is it still a rectangle if it is turned a different way? Will it still be a circle no matter what size it is? Are there different kinds of triangles? Use the large pictures of shapes that you have prepared and place them in a circle on the floor. Ask the students to stand on the shapes, one student on each shape. Students should turn in the same direction and move when the music begins. When the music stops, each student will stand on the shape closest to him or her. Now the teacher calls out the attributes of one of the shapes. Whoever is standing on that shape is out. Those students will sit in the middle of the circle. Continue until only one child remains. Read the book Mouse Shapes. The three mice in the book put shapes together to hide from the cat that is chasing them. Explain to the children that they will be doing an activity just like the mice in the book so they should pay close attention. After reading, distribute a variety of shapes and colors to students and a piece of white construction paper. The task is for the students to create a picture similar to what the mice did in the book. Each child should point to the shapes used in his or her picture and be able to name the shape. Greene, Rhonda Gowler. When a Line Bends a Shape Begins. Houghton Mifflin, 1997. Walsh, Ellen Stoll. Mouse Shapes. Harcourt, Inc., 2007. Burns, Marilyn. Scholastic, Inc., 1994.